Over the last few years, I have taken an interest in a form of photography dubbed "street photography." Unlike other photographic disciplines with obvious sounding names (wedding photography / newborn photography), the name "street" does not convey a clear meaning of the art form. Waiting for an opponent. Two people playing chess outside a park in Manhattan island. Leica M10 with 90mm Summicron f/2. Catching a ride. A young girl rides on her father's shoulders over the crowds of tourists visiting Rockefeller Center during the holidays. Leica M10 with 90mm Summicron f/2. Street photography might be more aptly dubbed "genuine photography" - the goal is to capture everyday scenes and interactions in a new and fresh way to highlight the beauty in our routine life. When I am shooting the streets, I am looking for genuine interactions; faces, reactions, expressions, moods, and emotions that are genuine and not prompted by the presence of a camera. Think about it.... when someone holds up a camera to your face, the first natural reaction is to smile and say cheese. But does that smile truly express your emotions and feelings in that moment? Unlikely. I spy. A woman looks out from her window on the busy New York streets below. Leica M10 with 90mm Summicron f/2. Selfie. 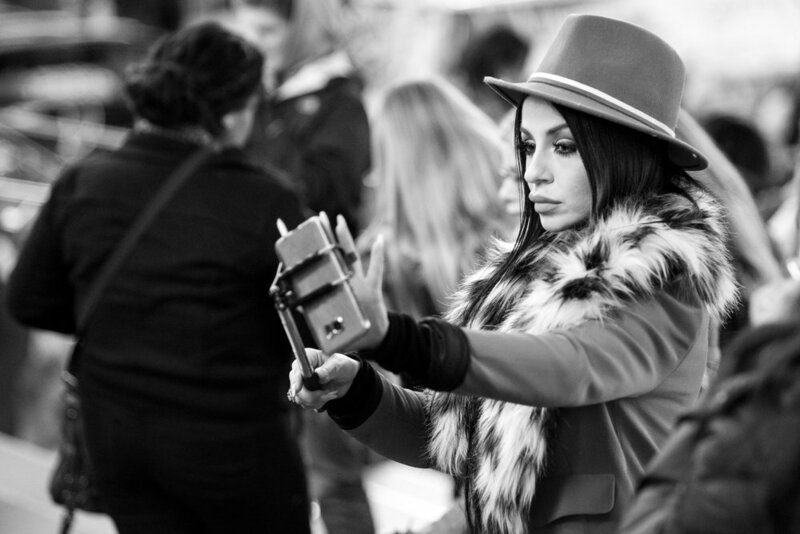 A woman dressed up in her finest fashion prepares her selfie in Times Square. Leica M10 with 90mm Summicron f/2. Crowd Control. A NYPD officer directs traffic and keeps the crowds safe as thousands of holiday revelers descend on New York's most popular attractions. Leica M10 with 50mm Summicron f/2. As a street photographer, I want to capture the subject's emotions and state of being without having the camera enter the equation and effect the expression. In order to do that, I often need to be stealthy and discrete. A large camera is off-putting. People don't want a stranger shoving a camera in their face. Which is why I use a Leica rangefinder (specifically, the M10) for my street shooting. The small and discrete nature of this camera lets me attract less attention, thereby increasing the odds of going unnoticed by my subject. Coffee Jolt. 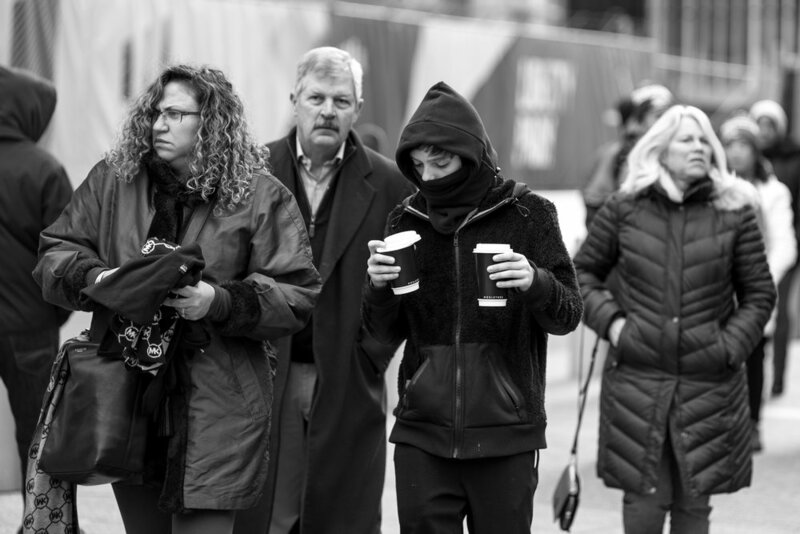 A kid carries two cups of coffee while walking with his parents around the 9/11 memorial. Leica M10 with 90mm Summicron f/2. The Eye. 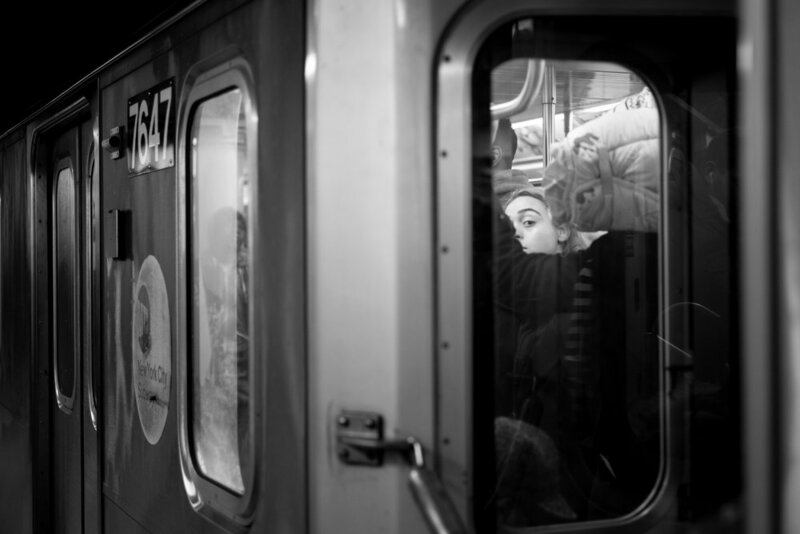 A passenger looks out of the window on an express train to Wall Street. Leica M10 with 90mm Summicron f/2. Philosophically, I want every picture I take to be a flattering one. I try to avoid any photograph that could embarrass or humiliate my subject. 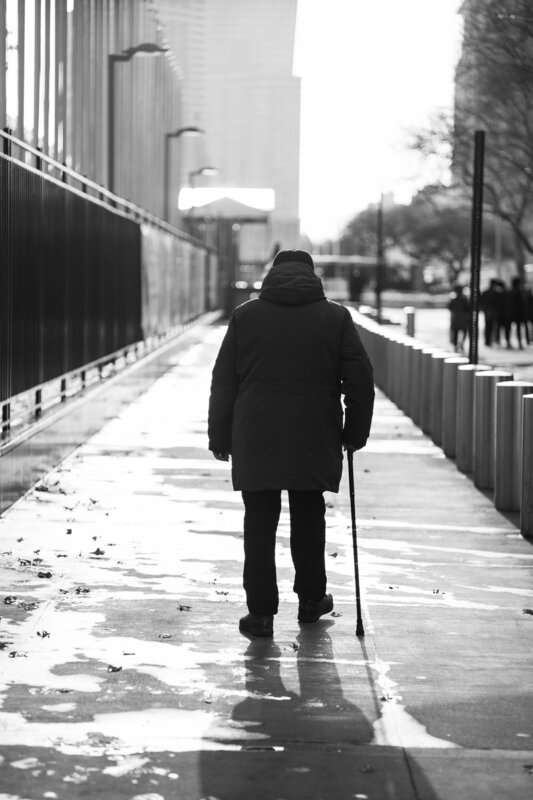 For instance, I don't photograph the homeless or disabled persons, with few exceptions. Ideally, when I am taking street photographs, I am invisible. The person never knows that I took their photograph, or if they do, they are not embarrassed. If someone sees me taking their photograph, I will smile and wave, showing that I'm not a threat. Sometimes I'll tell someone they were beautiful and interesting to me. Surprisingly, most people respond very well to this, and I have never had anyone get mad because I took their photograph. BFFs. Two women pose for a photograph in Times Square. I "plucked them out of a crowd" by using a longer focal length and narrow depth of field, thereby blurring the people around them and focusing the attention of the photograph solely on their faces. Leica M10 with 90mm Summicron f/2. Stroll. A man walks in front of the United Nations building. The harsh light and strong shadow became the sparkle that drew me to make this image. Leica M10 with 35mm Summicron f/2. As a photographer, I find street photography offers a unique challenge over some of the other photographic disciplines. When I am making landscape images, I often plan the photo, sometimes to a scientific extreme. But as a street shooter, I take whatever I get and roll with the punches. If it is sunny outside, I have to work with that. If it's raining, I work with that. The impromptu and impulsive nature of this type of shooting means I often "follow my nose" - if the light looks particularly good one direction, I'll walk that way. I walked 14 miles in New York one day without having any real plan - I just wandered Manhattan looking for things that caught my eye. I remain hyper aware of the location of the sun and will switch to another side of the street if the shadows and light is better there. My head is on a swivel, constantly looking for that sparkle. Street Blown. A woman's hair blows around in the wind caused by cars rushing past on the street nearby. Leica M10 with 50mm Summicron f/2. Patience. A cyclist waits for the crosswalk sign to turn in his favor. I was drawn to the fact that his face was covered, so the only place from where I could draw expression was his eyes, and he rewarded me with a very expressive moment. Leica M10 with 90mm Summicron f/2. "Sparkle" - that is what I am looking for as I walk. Sparkle is the photograph. Sparkle is the emotion, the color, the contrast, the shadow, the expression...the thing that pushes me to take the photograph. As a street photographer, I am instinctive. When I see sparkle, I shoot. If I wait too long and think about it, I have lost that moment of sparkle. When someone looks at one of my images and comments "I never would have seen that" or "how did you catch that," I know they see the sparkle. They are looking at the print and see the sparkle that pushed me to create the image in the first place. Lost. This is one of the very rare exceptions I have ever made to my rule about not photographing the homeless. This particular gentleman had positioned himself in the middle of the sidewalk, forcing pedestrian traffic to divert around him and creating a bit of a traffic jam. I wanted to capture the reaction from other people to having to divert around him and the story of what his day must feel like as thousands of people pass him by. Leica M10 with 35mm Summicron f/2. Smile. A man smiles as he reads something on his cell phone while riding the subway in New York. Leica M10 with 90mm Summicron f/2. 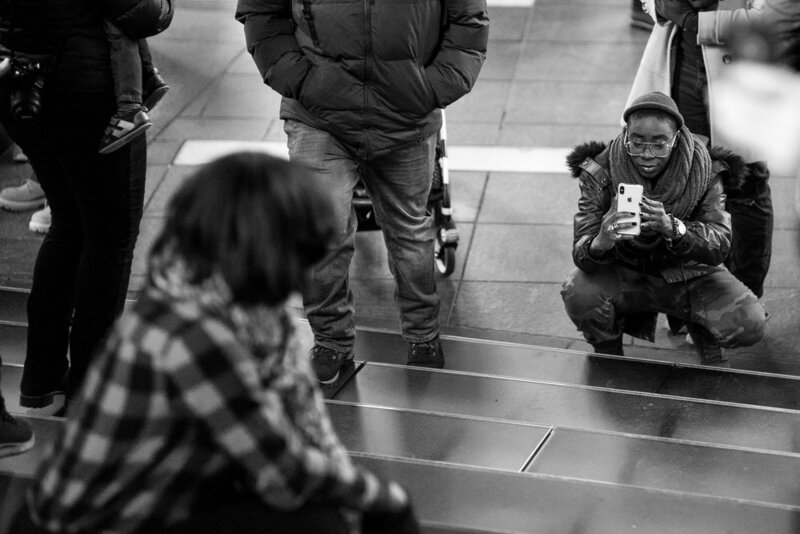 Street photography can also be about story telling. Not every image has a story, but sometimes the story is the sparkle. For instance, take this pro-Tibet rally I saw in New York. Thousands of people were marching across Manhattan to the site of the Chinese Consulate peacefully carrying signs and flags supporting Tibet. At one point, their march passes in front of the McDonald's restaurant near Times Square. I immediately saw a story, and began photographing that story. I was moved at the juxtaposition of American consumerism and the protected right of speech. Here are some people peacefully exercising their First Amendment right to free speech in front of one of America's biggest corporations. To me, this captures the essence of what makes America an incredible country -- there are so many places in the world where this scene would not be allowed, and the combination of the two created an emotional sparkle. Pro-Tibet rally participants march in front of one of America's icons of global consumerism.... McDonalds. Leica M10 with 35mm Summicron f/2. 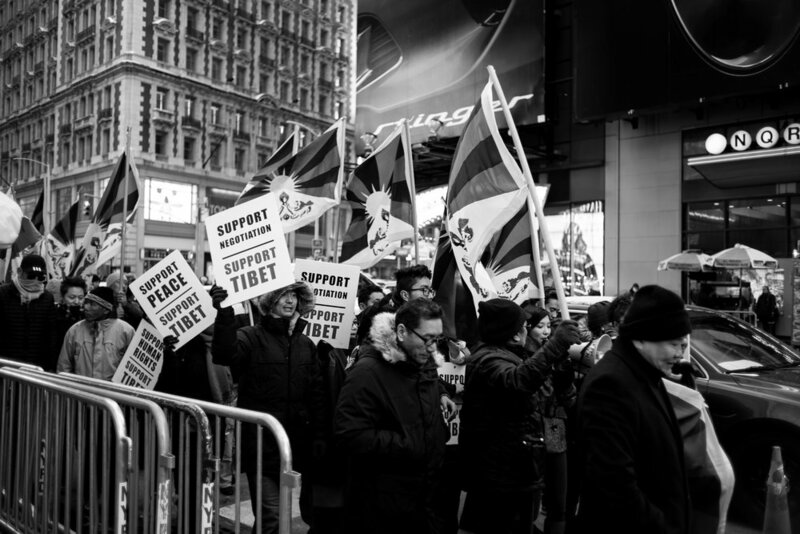 The pro-Tibet rally walked through Times Square demanding peace. Leica M10 with 35mm Summicron f/2. Stage. Rally goers assembled for a speech near the Chinese consulate. Leica M10 with 35mm Summicron f/2. Street photography often involves people, but there are some images I'll photograph without humans that still tell a human story. Usually, I try to convey human interaction with the environment in the non-people prints. These images may be more abstract and invoke the idea of people without clearly showing any in the scene. Sometimes they capture an irony or something so familiar that we stop noticing its existence. A Dinosaur. 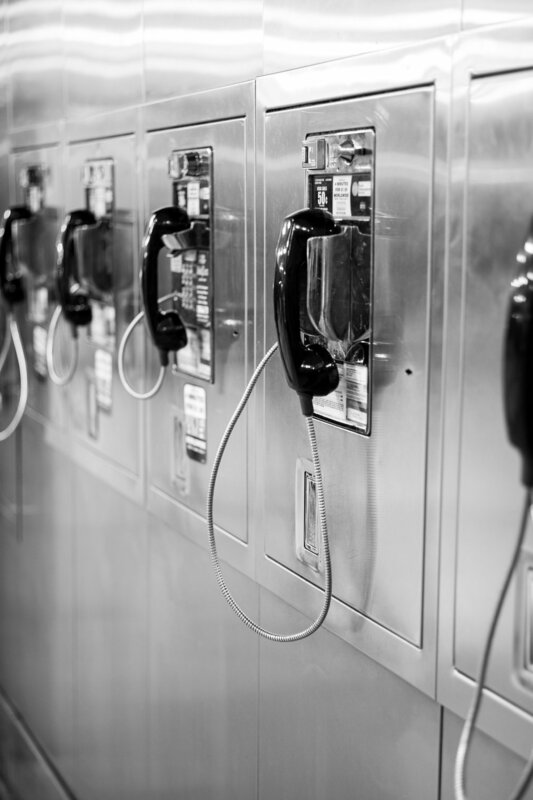 A bank of pay phones that see very little use in Grand Central Terminal. Leica M10 with 50mm Summicron f/2. Ready and Waiting. A FDNY truck sits at the ready to respond to any incidents around the city. Leica M10 with 35mm Summicron f/2. The Commute. I purposefully blurred this image by jerking the camera in a violent pan as the taxi approached. The goal was to create a shot that captured the blur of commuting and traffic in a city as busy as New York. Leica M10 with 90mm Summicron f/2. The Message. A simple chair might not have had the sparkle to catch my eye, but this chair, with the "No Crying Allowed" message caught my eye. Leica M10 with 90mm Summicron f/2. In some ways, everything I just described about street photography makes it sound like there is a good amount of "pray and spray"- but the art is anything other than. Pray and spray is a phrase used to describe what happens when I photographer just holds down the shutter and aims the camera recklessly in the hope of capturing a good shot. Look carefully at my photographs and you'll see that isn't possible. Scroll down and look at the three images below (then come back). Notice anything in them? Only the subject is in focus. Everything else has a smooth soft blur. That blur, which is referred to as bokeh (a Japanese word), is where the art comes into play. As a photographer, I drew your eyes to the subject- to a pre-determined spot - by precisely choosing what area of the print will be in focus. Don't believe me? Scroll down and look again. Steps of Time. 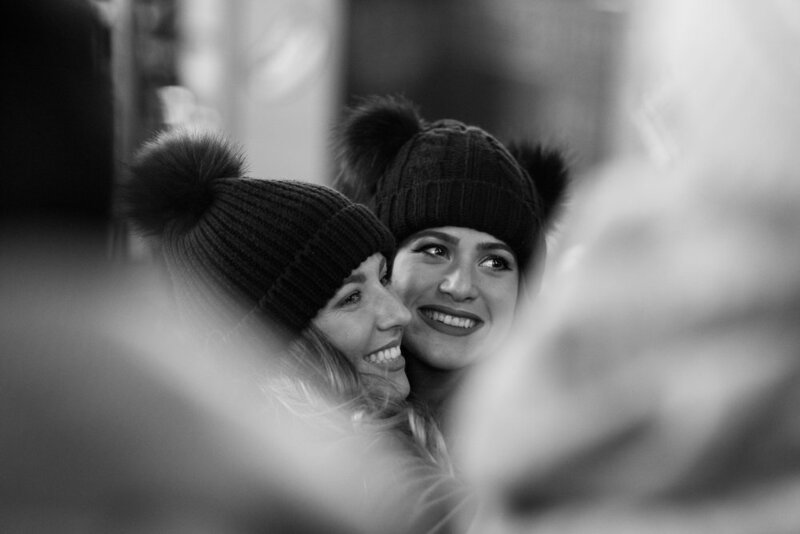 Two friends take pictures on the staircase in Times Square. I loved the attire and face of the individual holding the cell phone, so focused the attention of the viewer that direction by having the rest of the image slightly out of focus. Leica M10 with 90mm Summicron f/2. Sharing a Snack. 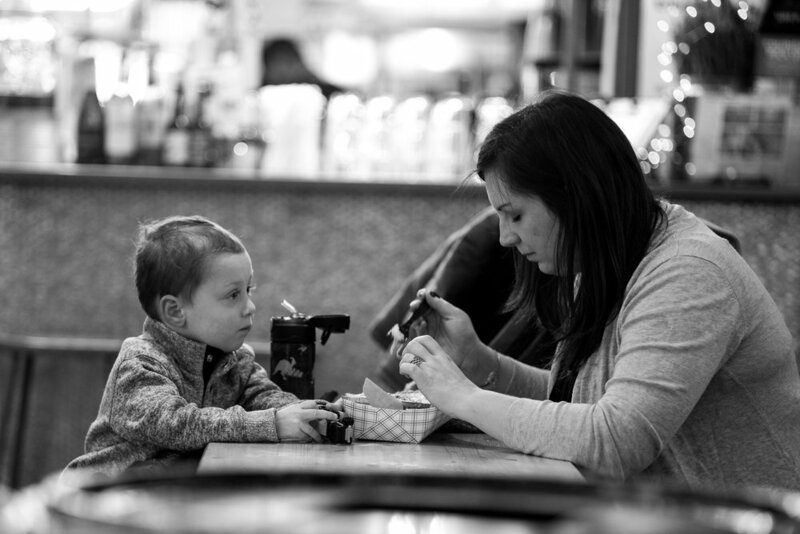 A mom and son enjoy a Sunday morning snack at an indoor food hall in New York. The scene is very busy with elements that could distract from the story of the shared meal, but selective focus and bokeh help me isolate them and tell the story the way I want. Leica M10 with 90mm Summicron f/2. The View. 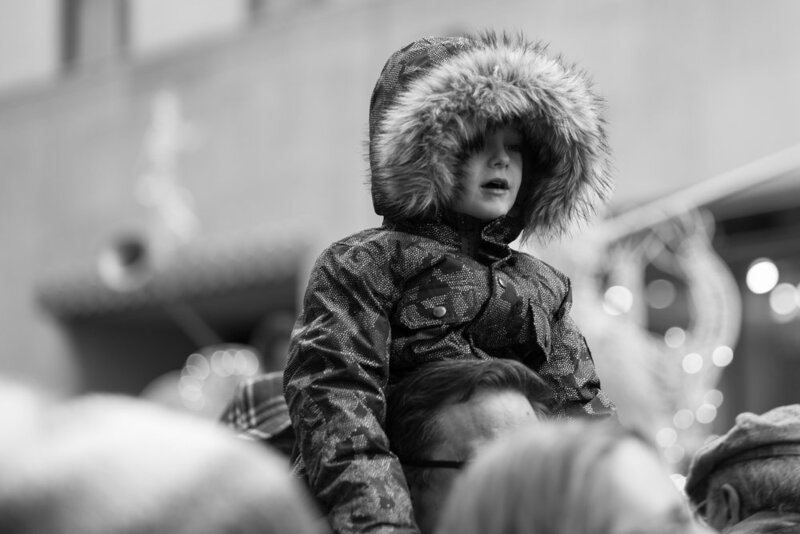 A boy is carried on his dad's shoulders to see the holiday tree in Rockefeller Center. Leica M10 with 90mm Summicron f/2. Each of those photographs has a super thin area of the image in focus. Now consider that the camera I use is a manual focus system - there is nothing automated or automagic about it. If I do a poor job of quickly focusing the lens, then my photograph is missed. I usually get one chance - a split second - to turn the focus ring on my Leica lenses to capture that sparkle. I won't lie - it's hard. I miss more than I catch. But the more I go out and shoot, the better I get. I have a lot of close misses - photographs I'd love another chance to take. But that's not how this works. In some ways, the thrill of getting it right is my drug. I'm addicted to the elation that comes from seeing a perfectly focused shot with the story I wanted captured. That feeling drives me back to the streets, looking for my next fix. Stormtrooper's Have to Eat. 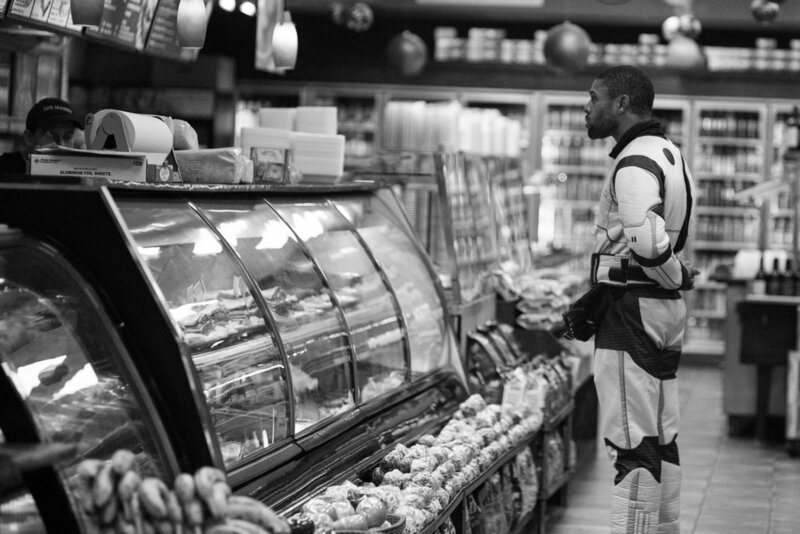 This man was dressed in a Stormtrooper costume, but had stopped at a deli to get a snack. Leica M10 with 90mm Summicron f/2. Patience. 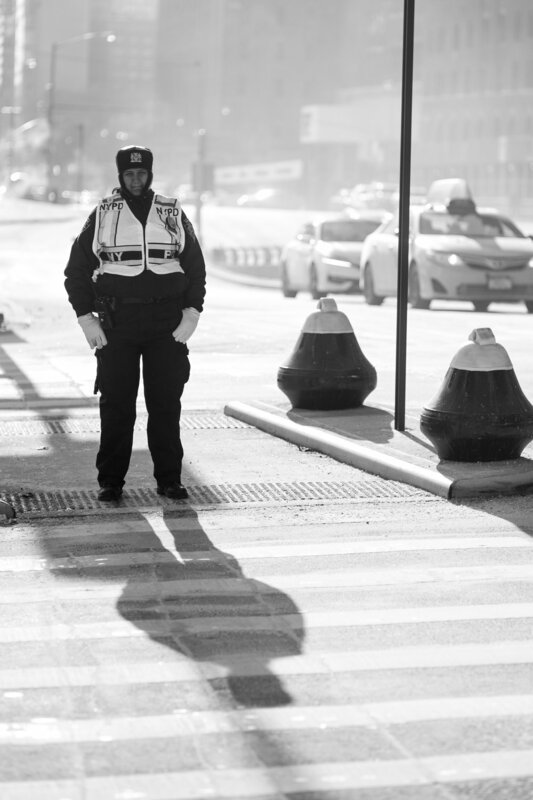 A police officer waits patiently for the light to chance before she begins directing more traffic over the intersection. The harsh light and strong shadows gave this scene the sparkle I was looking for. Leica M10 with 90mm Summicron f/2.